I almost forgot to blog today. The big reason is I haven’t done anything blog worthy this week. We had a nice quite Christmas at home. 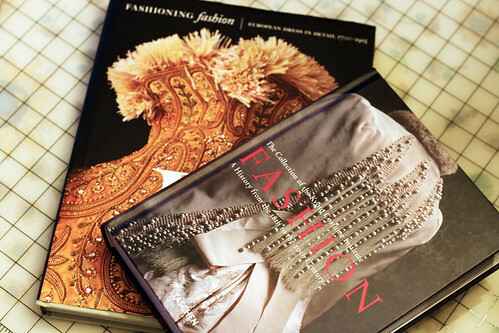 Rick gave me two wonderful Fashion History books. I love these types of books and spend hours looking at all the wonderful detailed photos imagining life when these clothes were made and worn. I am more interested in the making than the wearing though. The top book is from the Kyoto Museum in Japan. It is fabulous. It is hard to explain just how fabulous. The other book is from the costume collection at LACMA our LA Art Museum. I definitely need to find time for a visit soon. I am looking froward to all the wonderful things my blogging friends make and share in 2013. This entry was posted on Wednesday, December 26th, 2012 at 7:08 pm and is filed under Uncategorized. You can feed this entry. You can leave a response, or trackback from your own site. I know the fabulous-ness of the Kyoto book. That book is awesome! I don’t know the 2nd one but it sounds interesting too. Happy reading and looking! Gorgeous books! Was really drawn to the front image of all the beadwork on the back of the gown. Like you, I could sit for hours enjoying all the eye candy. Quilt history books have the same effect on me. The kids gave me a skein of qiviut yarn & a fabulous book on knitting Arctic Lace. Will share a photo on the next posting. Isn’t it wonderful that our hands can be so happy when creating something – and it goes direct to our heart!